Just 45-minutes outside San Jose is one of the lushest and the most unexplored National Parks in the country; Braulio Carillo National Park. This park is home to over 500 species of birds, and over 150 species of mammals. It is highly undiscovered and it’s a truly unique experience for those lucky enough to walk its trails. You will spend the day today on the lookout for swarms of army ants, the lattice-tailed trogon, yellow-eared toucanets, and so much more. This morning you will return to the San Jose Airport to board your domestic flight to Drake Bay Airport. You will be picked up there by Casa Corcovado Lodge and transferred via boat along the Pacific coastline to the lodge. You will land at the beach (be prepared to get your feet wet) and then make your way into the rainforest and Casa Corcovado. You will have time this afternoon to bird the lush gardens and trails around the lodge. 2.5% of the world’s biodiversity calls Corcovado home. This pristine, dense, lush jungle exemplifies everything that nature lovers can imagine. Sultry weather brings plants to life, dark shadows hide jaguars and tapirs and over 100,000 acres of primary rainforest creates a paradise for birds (and bird lovers). Scarlet macaws, turquoise cotingas, bicolored hawk, and the blue-headed parrot are just a few of the “must have” birds found in the region. Today you’ll explore the network of trails, enjoying all that Corcovado has to offer. Take your private boat from Casa Corcovado to Cano Island. Cano Island or “Isla del Cano” was an important burial ground for pre-Colombian Indians (1500 years ago) and then a place for pirates to hide and legends say, bury treasure. Today the island and its surrounding waters are a protected biological zone. Enjoy your boat adventure looking for pelagic birds, turtles, dolphins, and whales. There is also time for snorkeling if desired. You will leave Casa Corcovado today, by boat, heading North up the Pacific Coast and towards the small port town of Sierpe. The Pacific Ocean meets the Sierpe River where you will cross the river mouth and continue through the mangrove. Be on the lookout for shore birds and the elusive snowy Cotinga. You will reach the small port of Sierpe where you’ll board your transfer and continue North towards the Central Pacific and Carara National Park. You will arrive in time to spend the afternoon birding the grounds. Few places in Costa Rica boast the diversity and grandeur of Carara National Park. 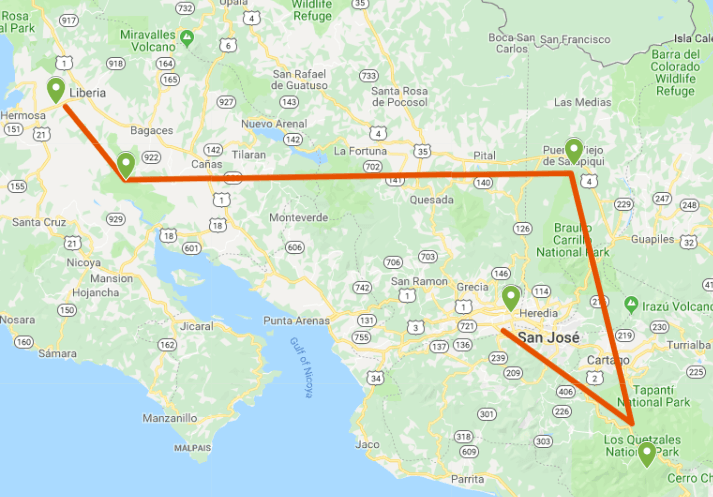 It is a key location as a wildlife corridor between northern and southern Costa Rica creating a sanctuary for a huge variety of animals and birds. More than 400 species are possible in this region. Keep watch for tinamous, manakins, and puffbirds (just to name a few). You will spend the entire morning exploring Carara. In the afternoon, you will take an expedition on the fertile Tarcoles river. A tour on the Tarcoles river is the best way to search for the mangrove vireo, pygmy kingfisher, and the boat billed herons; expect to see some huge crocodiles too.